Sunday May 26 1907 I was busy all forenoon. I had somethings to see to in the yard and about the chickens and put away a sack of sugar. I had our dinner by noon and was going down to Woolf, at home awhile and down to Mr Robinsons to see Mattie as she goes early tomorrow. Ida busy [illegible] here for some eggs. It began to rain and blow up cold about two oclock. I was glad I gave up going away. Monday May 27 1907 I did some sweeping and other house work in forenoon The men busy with the work. I went down to see how Fannie was in afternoon as she is sick. Was up home jist a little time. I came home at 5.20 to do evening work. 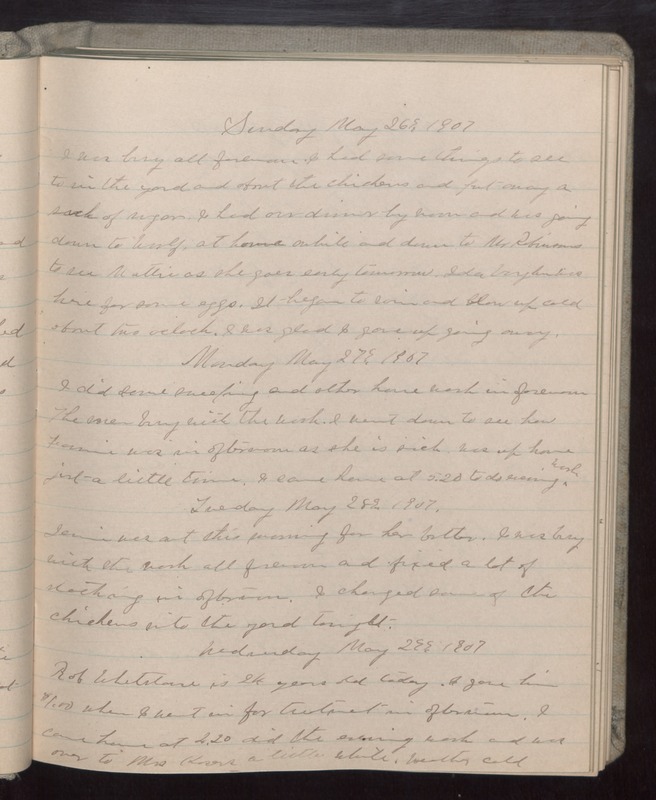 Tuesday May 28 1907 Jennie was out this morning for her butter. I was busy with the work all forenoon and fixed a lot of [stocking?] in afternoon. I changed some of the chickens into the yard tonight. Wednesday May 29 1907 Rob Whetstone is 24 years old today. I gave him $1.00 when I went in for treatment in afternoon. I came home at 4.20 did the evening work and was over to Mrs [Kovers?] a little while. Weather cold.